Trench Heating is ideal for Home, School, Office, public building heating in fact anywhere wall radiator space is at a premium or standard radiators don't fit the heating design brief. Trench Heaters are also ideal for targetted heating alongside Glass Facades or doors were temperature related condensation or heat cool spots exist. The Jaga Canal Trench Heater is available with multiple grille options including Roll Up and Rigid, Aluminium, Stainless Steel and wood, also several colour options to match your design requirements. 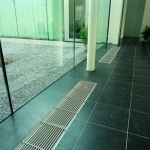 We offer free mainland UK delivery on our Jaga Trench Heaters. Our Trench Heater Radiators are made to order with a standard delivery time of 4 to 6 weeks. These Perimeter Radiators offer cutting edge infloor radiator technology with increased BTU outputs and heating response from the forced ventilation fans.